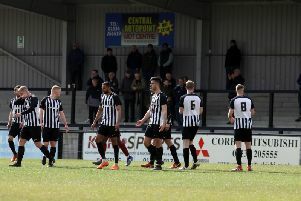 Steve Kinniburgh expects Corby Town’s huge clash with Peterborough Sports to be matched by a “big game atmosphere” on the Steel Park terraces. Just two points separate the third-placed Steelmen and second-placed Sports while Bromsgrove Sporting currently lead the way in a three-horse race for the sole automatic promotion place in the Evo-Stik League South Division One Central. Corby go into Saturday’s clash on the back of two good wins on the road this week as a 3-1 success at Kempston Rovers was followed by a 5-2 success at Welwyn Garden City on Tuesday night. And Kinniburgh is hoping a big crowd will be on hand to roar his team on in their biggest game of the season so far. “We are expecting the biggest crowd of the season so far,” the Corby boss said. “And I want those Corby Town supporters to come along with plenty of expectations of their own. “We will be doing all we can to win the game but we want them behind us and we want them to help drive us on. “We have the home advantage, we are in our own stadium and on our own pitch and we want our fans to help create that big game atmosphere. “We know that anything is possible in our home games but when you have that extra bit of support, it can really make a difference. The Steelmen did things the hard way at Welwyn Garden City in midweek as they found themselves 2-0 down inside the first 20 minutes before storming back to seal their 5-2 victory thanks to an excellent second-half display. And while he would like his team to make life easier for themselves, he believes their ability to fight back from losing positions is “something quite unique”. “I don’t know what the exact stats are but we have shown on numerous occasions that we can go on and win games from a losing position,” he added. “Regardless of when we go behind in a game, we know we have enough in the team to get back into it and then go on and win.